Before the trees in our orchard are blooming or our lilacs are showing mouse-ear leaves, a late April/early May pilgrimage to West Chesterfield brings us hope of spring and summer. Thousands of daffodils fill a deep dell beside Welcome Hill Road, and a bench sits under a cascade of pink and white star magnolia blossoms overlooking the woodland garden. Since Leslie Hadlock, who began planting the daffodils in the 1940s, died a few years ago, the gardens are not as carefully groomed as they once were, but the daffodils seem to have naturalized comfortably into the landscape of the little dell. 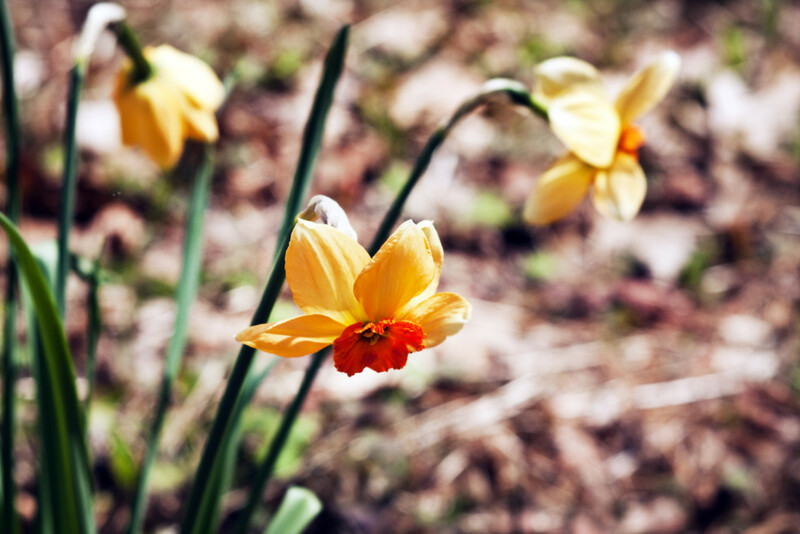 Meanwhile, neighbors along Welcome Hill Road have planted their own roadside and dooryard daffodils, more bright spots of spring promise lining the way to Mr. Hadlock’s garden. Spring is a good time to go to Chesterfield, which stretches along the Connecticut River west of Keene. Several woodland reserves are webbed with walking trails, and this is the season when lady’s slipper, trillium and trout lilies dot the forest floor. On Gulf Road, not far from Welcome Hill Road, Madame Sherri Forest is a good place to start. It’s named for the flamboyant flapper who built her stone house here, where she entertained her New York theatrical friends at lavish parties that set tongues wagging in the conservative Chesterfield of the 1920s. Learn about the exotic world of the costume designer, her fur coat, chauffeured Packard, and her set’s Roaring Twenties lifestyle from a sign at the entrance, then follow the short trail to the ruins of her “castle.” Remains of the walls, fireplace, chimney and terraces surround the curving stone staircase that rises incongruously from the forest, supported on stone arches. You can picture what it must have looked like when it was swarming with theatre friends that were just as flamboyant as their hostess. 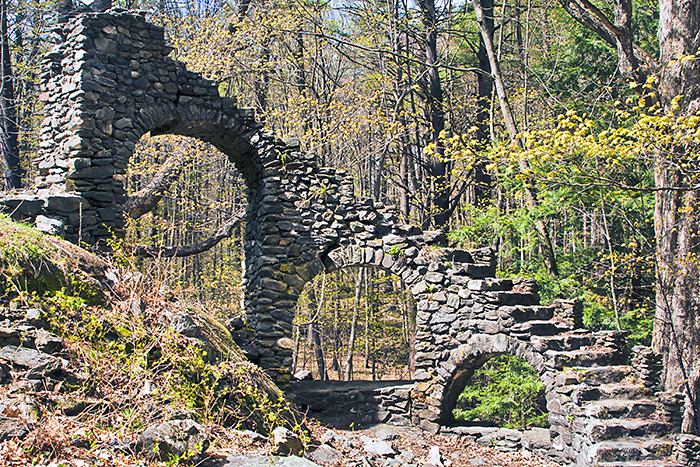 The ruins and the surrounding land are now protected by the Society for the Protection of NH Forests, thanks to Anne Stokes, whose interest in Madame Sherri and her story led her to purchase the land and donate it for public access. The 2-mile Anne Stokes Loop Trail through the woods passes the small Indian Pond, framed by the rock ledges and slopes of Wantastiquet Mountain. There are more views as the trail continues up a hill, before circling back through Cook Town Forest. Or you can leave the Anne Stokes Loop Trail, turning right at the junction with the Wantastiquet Mountain Trail, and climb less than a mile to the summit. From there you can see Mount Monadnock and across the Connecticut River Valley to the Green Mountains and the Berkshires. Early spring is also a good time to see Chesterfield Gorge, when the water levels are higher and the views of the falls are not obscured by foliage. More than just a pretty waterfall, the gorge is an especially interesting geological feature, as the water plunges from level to level over the angular rocks. Rather than falling straight from pool to pool, Wilde Brook zigzags from level to level, sliding across the series of sloping ledges to the next drop. Water, being water, flows downhill along the course of least resistance. In this case, a series of vertical fractures that cause it to change course several times at sharp angles. The gorge was carved by a sediment-laden stream that followed the natural terrain, further carving the ravine as glaciers melted. Water eroded along fractures to deepen and widen the gorge, a process that still continues. Now the erosion is not caused by glacial sediment, but by the action of frost as the falls freeze and thaw, and tree roots seize upon the smallest crack and split it as they grow. Pick up a brochure at the entrance for diagrams that illustrate this. OK, so I get inordinately excited about geological features, but the glacial erratic near the brook is not as big enough for me to ramble on about, so a zigzag cascade will have to do. All of these attractions are scattered close to Route 9 in West Chesterfield, but the village of Chesterfield has an attractive center along a ridge, at the edge of the vast Pisgah State Park. This is the largest state park in New Hampshire, a 13,668-acre wilderness with some of the state’s most diverse woodlands. The Old Chesterfield Road is now a multiuse trail leading past Lily Pond and on to the larger Fullam Pond; the park is networked with other trails. After all this activity, you’ll be looking for a good dinner and a comfortable place to sleep. Back on Route 9, just opposite Welcome Hill Road, the Chesterfield Inn stands on a hillside above the Connecticut River. Large windows in the guest rooms make the most of the sunset view and the surrounding landscapes, which in the summer include flower gardens. The large guest rooms are in the original farmhouse and newer adjacent buildings, which have ground-floor access. Many of the rooms have gas fireplaces, and a large brick fireplace is the focal point of one of the comfortable guest parlors. The entire property radiates gracious hospitality and comfort, but it’s the inn’s dining room that steals the show.Chef Carl Warner keeps ingredients as local as possible — organic vegetables and herbs are from Pisgah Farm and maple syrup is from the Mitchell Farm, both in Chesterfield; breads are baked daily at the inn. 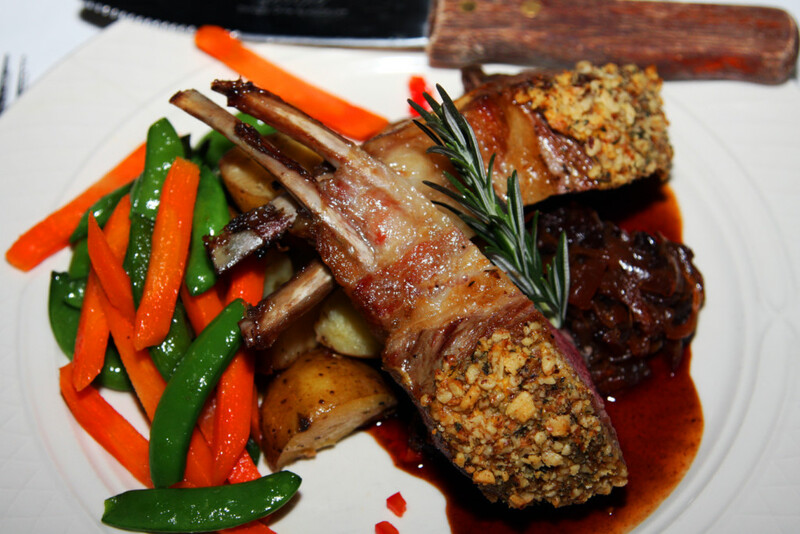 We can testify that the inn’s signature dish, rack of lamb crusted with walnuts and rosemary with a merlot demi-glace, is worth traveling for. Chesterfield is just as appealing in the fall, when the views are framed by bright maples and birches, and the woods are filled with the crisp scents of autumn. But for us it’s the daffodils that bring us back each year for a promise of summer.